We got back Monday. Thursday it rained all day. I took the View into Cullum and Maxie, our Winnebago Dealer, to get the radio antennae a trip ripped off in St. Petersburg, replaced along with a number of other small maintenance items. Friday afternoon we drove to Murray, put the View away in the shed, and drove the car to our marina. The Katy Leigh was summerized quickly without difficulty. Our good friend Brandon was beside us on Billaboat. It didn't take long to discover all the stuff we forgot to bring. Like my computer that was left on the motorhome. We went back today and got the stuff we forgot, took the view to the carwash and saw a the movie, Iron Lady, at the Cheri Theater while the crew worked on the View. Then it was back to the shed, to drop of the View and get the car and go back to the boat. Of course we forgot stuff we bought in Murray and left it on the View. 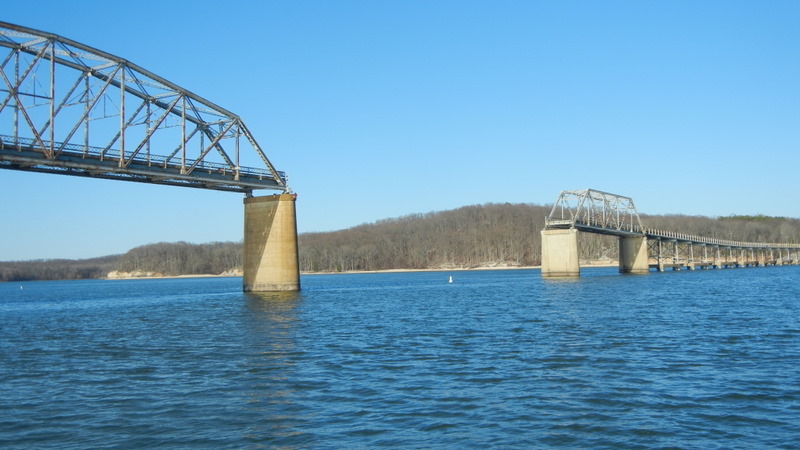 It was a beautiful day and we headed out on Billaboat to see the bridge with its missing span. 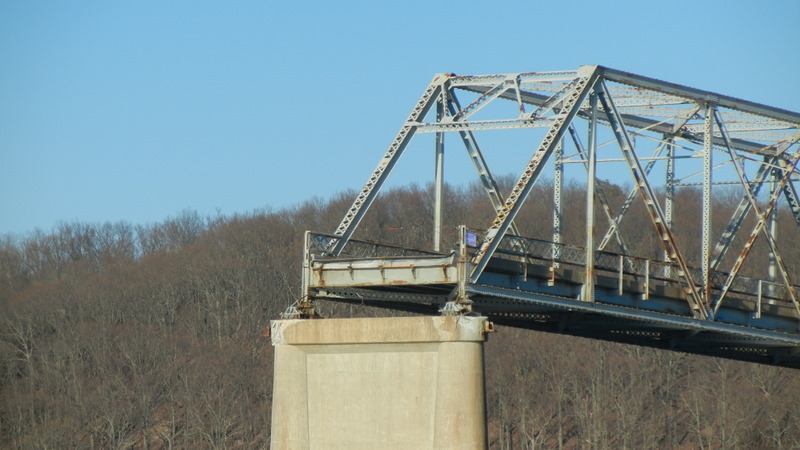 The Governor was here last week to announce that the missing span will be replaced. They found all the original drawings and let a $7 million contract to replace the span no later than this coming Memorial Day weekend. It seems that the ferry idea would not work. There are 2,400 vehicles per day and the ferry can only handle 40 vehicles per hour. Given these numbers the waiting line at the end of the first day would be 6 miles long. Clearly not practical. I learned that the ship was repaired in Paducah in 2 days and that most of the damage was to its bow handrails. The Governor said the shipping company is suing the state since at least one bridge light was not working. He said in law a good offence is the best defense. I doubt if the shipping company will win that one. The Coast Guard has now installed 4 new channel buoys marking the main channel. Formerly there were only 2 red buoys each ¼ mile or so from the bridge. It is interesting to note in the close up there are only 5 horizontal rods holding the span from sliding off the bearings. Apparently it doesn't take much to knock a span off the abutments on these old bridges.